www.khakicorpsimports.com The place where I got my Ferret. Good selection of vehicles for sale and a lot of information about armored vehicles. www.tankmuseum.org Disneyland for fans of Armor and AFVs. One of the best collections of tanks in the world. www.groups.yahoo.com/group/Ferret-heaven/ Yahoo discussion group about all things Ferret. Great bunch of guys and gals who will answer all your questions. Great source of how to info for mechanic work, proper paint and decals, and anything else. www.ferret-afv.org Ian Wallace's Ferret site. Lots of info, pictures, and such. www.kimskraftsla.com Bill and Kim Leake are local artists from Metairie, Louisiana, who specialize in custom crafts and paintings with a uniquely New Orleans flavor. Bill created the awesome painting of my Ferret seen above. 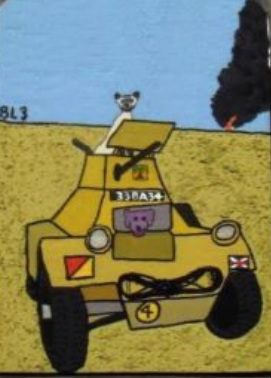 Lavender the Lab, his trademark, can be seen driving 33BA34, and my cat Dippy is working the turret.